The possibility of leading a peaceful and harmonious life is available if you can find the right information. Very few books give you brief and clear ways to comprehend yourself and the world around you. This book will lead you, at your own pace, to a better understanding of yourself, life, the world and the universe, reaching into the realm of creation itself. It contains information about meditation as well as hundreds of definitions and explanations regarding various facets of meditation and life itself. This reading will help you reach a higher level of awareness, thus a higher level of peace and happiness. Presenting the findings of over 45 years of inner research and meditation, this book may very well change your understanding of life! 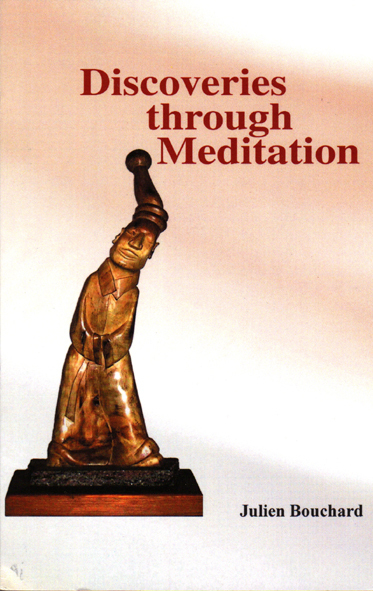 for more information about the book "Discoveries Through Meditation"
Bouchard has spent most of his life, traveling throughout India, the Middle East and South and Central America where he has explored ethnic cultures and studied their philosophy and spiritual practices. This book is a culmination of those travels, studies and his own reflections. The author has created a series of philosophical and spiritual meditations, and collected then here in a dictionary format. The layout lends itself to the search for a specific reference or selection of a random passage for meditation or discussion. Each meditation illustrates the impermanence of the material world and intertwines the connection between each human being and that between humanity and the essence f spirit. The aim of this book may be to bring about a greater understanding of ourselves and others, our spiritual essence and clarity about the world we inhabit, or to remind us not to be seduced by the impermanence of the material world, either way, its message hits home. To accentuate the search for enlightenment, each meditation ends with a question that evokes deep spiritual thought and encourages the reader to develop his or her critical thinking. From the word “Abandon” to “World”, Bouchard has compiled a wide range of concepts and contemplations upon them, so that the reader may slip free from the chains of illusory reality and touch up on the light of truth. His language is refreshingly crisp and concise which is an indicative of his honesty and passion for truth seeking. This is a vivid and thought provoking book that teaches challenges and inspires.